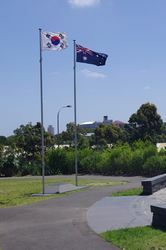 A monument commemorates the Australian and Korean veterans of the Korean War. It honours the military personnel of the Commonwealth of Australia and the Republic of Korea who served, suffered and died on the Korean peninsula during the years 1950-1953 in the cause of freedom, peace and justice among nations. During the three year conflict, 339 Australians and 230,000 South Koreans made the supreme sacrifice. It is a monument that honours a friendship forged through war, between two different countries, cultures and communities. The monument features 136 Rose of Sharon flower sculptures which commemorate those lives lost from New South Wales. The monument cost $700,000, of which $350,000 was contributed by the New South Wales Government, with the remainder raised by the Korean community and veterans’ groups, along with $25,000 from the Commonwealth Government. The monument features a circular stone wall enclosing the site symbolising “strength”. A central pathway based on the taeguk or yin and yang symbol found on the South Korean flag symbolising “commemoration”. A field of metal sculptures based on the Korean national flower, the Rose of Sharon, symbolising “regeneration” and polished concrete blades representing the rugged mountains of Korea representing “remembrance”.